I'll never forget this phone call I had with a customer. He'd bought my course for $299. After testing that price for a year, I decided to lower it to $199. I gave folks who'd bought at the higher price the option to have a free coaching call with me. At the end of the call, he commented: "You know, you really should be charging more for your course." I listened as he told me about all the other courses he'd bought. Many of them had cost him thousands of dollars. He insisted he'd received good value from them. "People will happily pay more for your course," he finished. Suddenly, there was a commotion off-screen. His girlfriend had been listening to our conversation. And she was pissed. She didn't know he'd been spending all their money on courses. I could hear her yelling at him off-screen. The call ended abruptly. These days, lots of folks are advising that you "charge more," but this isn't always the right advice. For years, Rob Walling, Jason Cohen, and Patrick McKenzie have been advising startups to "charge more." Early in bootstrapping's history, this was much-needed advice. It was something the community needed to hear. In 2006, Patrick McKenzie noticed that developers consistently "undervalued their software." In a 2012 newsletter, he sharpened this even more: "technical founders perceive code as being worth its cost and its cost to them is zero." In talks and blog posts, bootstrappers challenged each other to test their pricing. It had a positive impact on many new entrepreneurs. Folks like Ruben Gamez increased their prices and saw good results. But gradually, I feel like our community's discussion on pricing has devolved. These days I hear only two words: "charge more." "What? You should charge more!" We've lost the nuance. We're treating "charge more" like a startup panacea. Even bootstrappers used to write thousand-word blog posts to explore the topic. But now it feels like we've replaced all that depth with a two-word meme. It seems strange to me that folks give this advice without the relevant context. How are they so confident that "charge more" is right for this person's market and stage of business? My goal for this post is to have a balanced discussion about pricing software. Let's get into it. In SaaS, most niches have multiple competitors. When MailChimp introduced its freemium plan in 2009, it rocked the ESP world. Suddenly, customers could have up to 500 subscribers for free. Campaign Monitor, who was charging $15/month for this, had to reduce its price to $9. 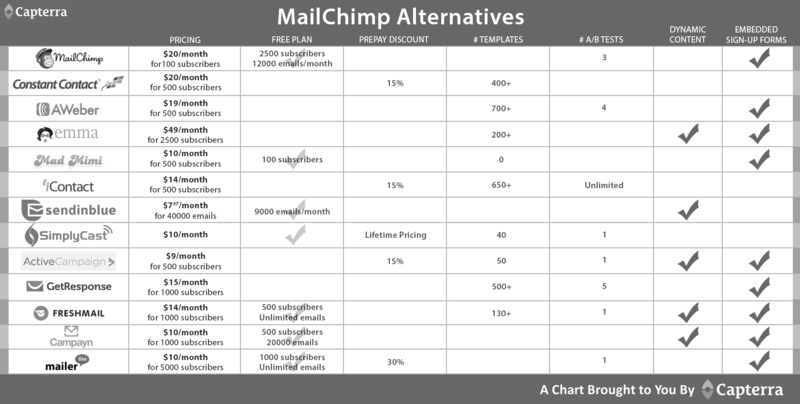 Campayn decided to match MailChimp's offer (500 subscribers for free). Some competitors, like ConvertKit, can charge marginally higher prices. But everyone's been anchored by Mailchimp's pricing. Unless they're going after a premium niche, no one is going to double their rate. They won't double their price, because they know that customers do comparison shopping. If you have roughly the same features as MailChimp, but cost 2x as much, it's less likely that you'll get picked. Building a new product is like running a marathon, but starting an hour after everyone else. As a new product, you're asking customers to switch away from the incumbent. In their eyes, your app is untested, unproven, and has fewer features. Is now really the time to ask them to pay more? Since launching our app (Transistor), we've learned that 38% of our customers switched to us from a competitor. They're mostly coming from Simplecast and Libsyn. At $19/month, our initial tier is already more expensive than theirs ($15 and $5, respectively). Would we have gotten as much traction if we'd started at $29, $39, $49? Judging from the conversations I've had with customers, the answer is "no." In each of these stages, you have to approach things differently. In the very early days, I don’t know that you want to charge more. But you should charge something. This makes sense for our stage: we only launched eight months ago. We haven't yet built the features that will make our premium tiers more attractive. In your early stage, two things are essential: your customer focus and your value metric. If you can nail these two things (even if you get everything else wrong), you’re typically fine. and providing them with more value. 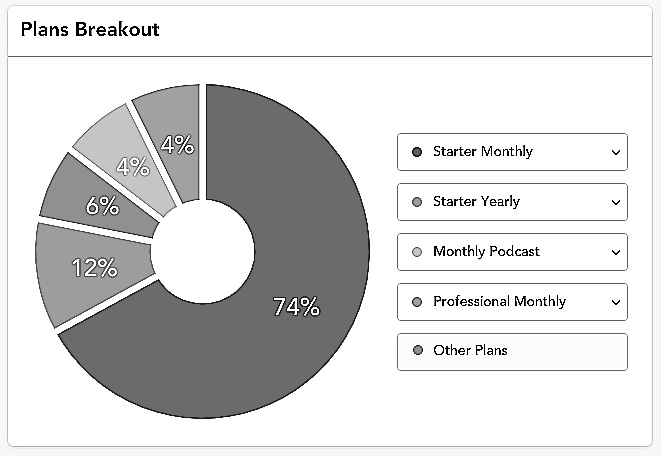 Initially, we thought our value metric for podcasts would be "monthly downloads." That is important to a lot of our users. But, there's a segment of our premium users who don't care about listener numbers. For them, value means something different. We need time to understand our different customer segments, and what brings them value. After that, we can decide which segment(s) we want to pursue, and how to give them great results. And then, we can look at pricing. "Price based on value" is another misunderstood startup mantra. He was talking about investing, but the line holds for pricing products too. "Customers generally care only about their desired outcome. Value Pricing is knowing the value of your service as perceived by your target market." For example, if you pay me $10,000, but I bring you $100,000 in new sales, that's a pretty good deal. You're getting 10x more value than what you paid. But in practice, figuring out "value received" is more difficult. Another example: imagine you're running a design agency and it's disorganized and chaotic. One day, you discover Basecamp. You try it out, and it magically everything gets better: you are calmer, your employees are more efficient, and your customers are happier. How do you quantify the value you're getting from Basecamp? Is it worth $100 a month? $1,000? $10,000? The answer is subjective. For many SaaS products, the value the customer receives is hard to quantify. You might say: "we save $x on salaries," or "this app saves us time," or "it helps us build our brand." But providing a direct correlation between "money paid" and "value received" isn't empirical. "I paid $100 and got $1,000 back" has a clear cost/benefit outcome. But most of the time it looks more like this: "I paid $100 and now I feel like I'm making progress." Value pricing is often based on a feeling. Does it feel like I'm getting a good deal as a customer? Then he talks about a product on "the opposite end of the spectrum:"
Segment provides an incredible amount of value, but they charge a ton for it. The high value is equally matched by a high price, not leaving any surplus. In this example, Segment is "charging more." Right now, Nathan is willing to pay their price, but he doesn't feel good about it. "We end up resenting a company that we’d normally love, " he says. It could be different, if they considered "leaving some value on the table." Last week I spent $10 at a national taco chain and I’m still shuddering at the expense. Economics tells us they're better because they maximized profitability. Problem is, I’ll never buy from them again. We should pay attention to this idea of charging less for the value you provide. It's the flipside of "charge more," and it has its own advantages. By keeping prices low, you make renewing a no-brainer. You make switching 'not worth the effort.' You'll lower ARPU, but you'll get higher long-term retention. Let your customers think they got a great deal. They’ll tell friends about you, who then become new customers. And those customers will love you, because you’ll give them good deals too. I'm not saying that "charge less" is right for you, any more than "charge more" is. But it's worth testing. We put a large dent in churn by reducing the cost of our plans. We were able to retain AND acquire more users for a net gain. LTV shrunk a tad but CAC was still well below, so it was a no brainer for us. If your business is at the right stage of its development, you should be testing your pricing. But make sure you're testing the right things, over the right timeframe. Increasing your price might look good in the short term, but could be worse for revenue in the long-term. Over the years I've done a lot of price testing. Important: measuring impact through to churn (I've been surprised a couple of times). I've had pricing changes that seemed good at first (initial 60 days). But then churn increased on higher tiers or there were more downgrades to lower tiers. Also: pricing changes that seemed like a nice increase but overall have ended up with slightly lower LTV. In his case, a price change resulted in him losing customers at a higher rate, and making less revenue. He wouldn't have noticed this trend if he hadn't tested the price over 60 days. So, should I charge more, or charge less? the stage of your startup. "Charge more" can be good advice. But, depending on the context, so can "charge less." The only way to know for sure? Seek to understand your customers better, give them as much value as you can, and then, test your pricing. I hope this starts a broader discussion! Tell me what you think.